TALK ABOUT Northern soul – these guys have it in three-storey-with-a-mezzanine-shed-loads! Beats & Pieces Big Band have come a long way in seven years. From their tentative beginnings as Manchester students, through to their early EP and local gigs at Band on the Wall and the Royal Northern College of Music, they have developed a keen following which, on the basis of last year’s blazing Manchester Jazz Festival appearance, is swiftly on the rise. Their excellent 2012 debut album, Big Ideas, turned more than jazz heads, brought Jazz FM and Parliamentary awards, and prompted invitations to perform internationally. Directed by enthusiastic composer, arranger and instrumentalist Ben Cottrell, and drawing big band comparisons such as Loose Tubes and Matthew Herbert (due to their infectious energy, use of electronics and an unorthodox, contemporary approach), 14-strong Beats & Pieces now release their much-anticipated follow-up, All In – a bristling statement of their current stature. Three powerful banks of three (saxes, trumpets and trombones) are completed by guitar, piano/Rhodes, bass and drums; and buried amongst the irrepressibly slick grooves, their quite-likely uniqueness is characterised by the occasional, endearing whiff of no-nonsense Lancashire colliery band (confirmed by the album’s tailpiece). Collective influences include Gil Evans, Quincy Jones, Radiohead and Björk… so the resultant six originals and one interpretation (recorded essentially live in the studio) are both dynamic and even entertainingly perplexing. Opener Rocky blasts its way through the first three minutes with all the gritty verve of an extreme, full-throttle movie car chase – raucous and wayward, yet somehow together. Pop hits a relentless, rapid, ‘Can’t Hurry Love’ groove, with Nick Walters’ chattering muted trumpet and Anton Hunter’s guitar riding the swelling, crashing then ebbing wall of horns, whilst Patrick Hurley’s ostinato Rhodes impression of Rain is particularly effective, underpinning tight, reverbed, brassy arrangements before soloing freely. Ten-minute expanse Havmann (‘the man from the sea’, inspired by Antony Gormley’s statue installation in Mo í Rana, Northern Norway) feels like a new departure; its piercing, semitonal, synth rise-and-fall seems redolent of early Genesis or Robert Fripp, with the icy, spiky urgency of the overlapping extemporisations perhaps echoing the Scandinavian fjords experienced by Cottrell. Originally composed for and workshopped by Norwegian band Ensemble Denada, its impressive slowly-building intensity glints to Graham South’s echoic flugel horn and cinemascope unison trumpets. Hendo is classic B & P – all solid bass drum, swirling baseline, impudent wah-wah guitar, crescendoing blasts and Sam Healey’s typically flamboyant soprano sax. Revealed a few years ago at an RNCM gig, Ben Cottrell’s sultry New York-style reading of David Bowie’s Let’s Dance finds its place here. A great example of the director’s prowess with arrangements of the unexpected, its lazy demeanour erupts into funky Average White Band euphoria, complete with cheeky, rising James Taylor (Starsky & Hutch) quotation courtesy of Sam Healey’s alto. And so to close, the aforementioned miniature of misty, brass band nostalgia, Fairytale – so beautiful in hymn-like simplicity. Long may this forward-thinking band continue! 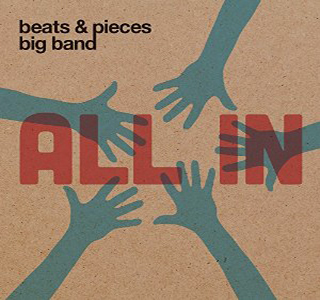 All In is released on 8 June 2015, by Efpi Records, and is available here. The album officially launches at Soup Kitchen, Manchester, on 7 July 2015, and at Ronnie Scott’s the following evening.